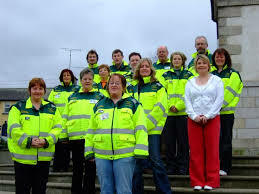 Tinahely Community First Responders was founded in 2005, and to date has been called out to over 200 emergencies in the Tinahely area. Completely self-funded, there are currently 15 active volunteer members trained by the HSE Ambulance Service in Adult, Paediatric and Infant CPR, Foreign Body Airway Obstruction (choking), use of Automated External Defibrillator’s (AED’s), Chest Pain management, F.A.S.T. for possible stroke detection. Upon receipt of a 999 call, they are dispatched simultaneously with the Emergency Ambulance. Through local fundraising there are now two public access defibrillators located in the village. One is located on the outside wall of Murphy’s Butchers, Dwyer Square, on the Kevin Street Wall. The second AED will be located at the Centre Garage, Lugduff. Both are accessible 24 hours a day. The support of the local community is vital in keeping this very worthwhile scheme up and running and their support so far is very much appreciated. You could be a life saver.